It’s a family affair – Rick pictured in a wheel yoga pose with his daughter, Kristina, and granddaughter, Leah, at Willamette Power Yoga. Rick Brand works in OSU’s Academic Technologies media services. He has been a part of the Faculty Staff Fitness Program for the past 30 years. Synergies: What is your fitness routine? Synergies: What types of activity do you enjoy the most? Is there anything you really want to try? Synergies: What is your fitness philosophy? 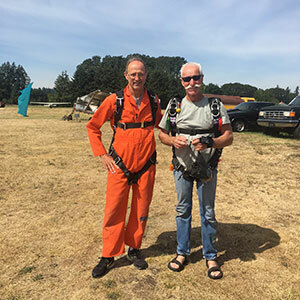 Rick pictured with his instructor when he went skydiving at Eagle Creek last summer on a challenge made with his dinner group. Synergies: Why are you active? What affect has that had on your well-being? Synergies: How long have you been active? Synergies: Have you had any challenges or obstacles you’ve had to overcome in regards to physical fitness? If so, how have you addressed them? Synergies: What advice do you have for people who are thinking about becoming active or who are struggling to fit it into their busy lives? Synergies: What is your favorite healthy food? 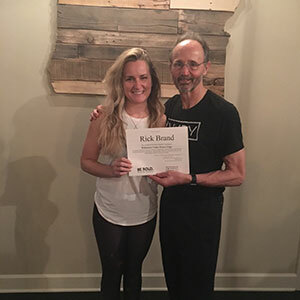 Rick became a certified Baptiste Yoga instructor at Willamette Power Yoga in March. Synergies: Do you have a guilty food pleasure? Synergies: Anything else you would like to share with readers? Interview and answers complied by Kinesiology student Jerick Haynes.